Though malaria infections have dramatically fallen since 2010, 91 countries and areas around the globe still have ongoing malaria transmission which causes half a million deaths annually. Moreover, the progress we’ve made so far risks becoming undone in face of rising insecticide resistance. Luckily, humans are cleverer than mosquitoes, as one team from Harvard University recently demonstrated. The researchers from the Harvard Chan School found that a non-toxic chemical can stop the spread of malaria just as effectively as insecticides. Malaria is caused by the malaria parasite, Plasmodium falciparum, which is carried by Anopheles mosquitoes. When these mosquitoes were sprayed with a synthetic chemical called DBH (dibenzoylhydrazine), the females’ reproductive cycles became disrupted. DBH mimics the action of the steroid hormone “20E” (20-hydroxyecdysone), which like estrogen in humans, plays a key role in the female mosquito’s reproductive cycle. Experiments suggest the females which came in contact with the spray laid fewer eggs, didn’t mate successfully, and died faster than non-treated mosquitoes. The higher the DBH dose, the more pronounced the effects on the mosquitoes’ reproductive cycle. The DBH-treated mosquitoes were also less likely to be infected by Plasmodium f.
The chemical was expelled both as a spray and in bed nets, with both methods proving equally effective at treating the mosquitoes. Because DBH is non-toxic, the chemical is not only suitable for use in bed nets where non-toxicity is of the essence but it’s also inert to other forms of wildlife or food crops. “The study demonstrates the importance of basic research on mosquito biology for developing new tools against malaria,” said Caroline Buckee, co-senior author and assistant professor of epidemiology at Harvard Chan School. 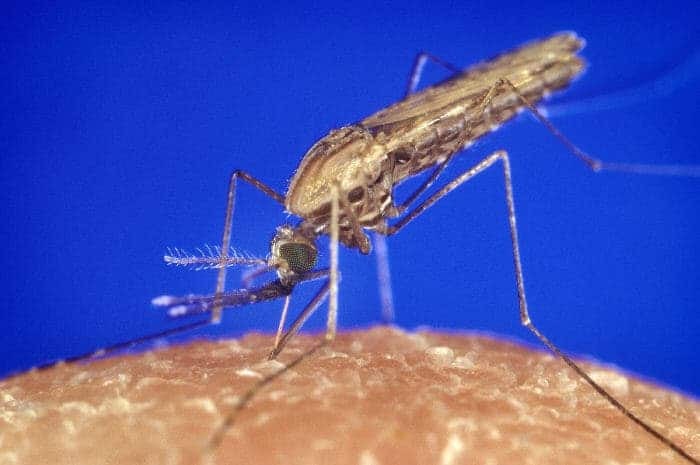 “Modeling the impact of these effects on Anopheles population dynamics and Plasmodium transmission predicts that disrupting steroid hormone signaling using 20E agonists would affect malaria transmission to a similar extent as insecticides. Manipulating 20E pathways therefore provides a powerful new approach to tackle malaria transmission by the mosquito vector, particularly in areas affected by the spread of insecticide resistance,” the authors wrote in the journal PLOS Pathogens. In 2015, nearly half of the world’s population was at risk of malaria. Most malaria cases and deaths occur in sub-Saharan Africa, and it is here that DBH might reap the most benefits. Before that happens, more tests are necessary before the chemical is deemed completely harmless to animals other than mosquitoes.